I think I expected something different when I started Sorcery Code and it took me a little bit to get fully committed to it. However, it really picked up by the second half, though, and I’m eagerly awaiting the next book. The characters in Sorcery Code are the kind that you don’t instantly love or hate, but grow to feel very strongly about as you get to know them. Gala was by far the most interesting character. She is a product of the Spell Realm, created sort of by accident by Blaise, and a wonderful contradiction of maturity and innocence. Brand new to life and the physical realm, Gala is so innocent and unaware, but at the same time she learns and understands at such an incredible rate (of which I can’t help but be jealous) that she never seems truly child-like. Watching her grow and discover more about her world was fascinating and exciting at the same time. Probably because of who created her, she has a high capacity for empathy and caring for others, which was pretty great. However, I wasn’t a huge fan of how quickly she started having romantic feelings for Blaise – for someone so new to the Physical Realm it felt like a stretch and as her creator, it also felt kind of off for me… to me, he should be more like a father than a romantic interest. But it wasn’t a dominant part of Sorcery Code and certainly didn’t hurt the overall story. Blaise was my second favorite character to read about. He’s an incredibly gifted magic practicer and marvelously eccentric. I don’t think it’s possible to not like him, considering that he’s so selfless and caring. I would have like to get to know him better actually – and to have spent a little less time with Augusta, his ex-fiance. Don’t get me wrong, Augusta is an important part of the story and she fills in important details about this world. She’s old nobility and, unlike Blaise, wants to keep the peasants ignorant because she’s afraid of change and losing her position. Although she’s probably the misunderstood character of the series, I don’t like her right now and frankly have no sympathy for her. There was a host of other characters that filled in the plot and the world really well. Augusta’s new love interest – Barson – adds an interesting element to the story as he’s not a magic practicer, but a solider and is involved in some sort of sub-plot that has yet to be fully developed. The peasants we get to know are equally important to the plot and pretty lovable. The first part of Sorcery Code is a bit bogged down with the world development, which is very complex. Spells are not simple things in this world – Koldun – and laying that out took some time. Although it was a little rough to get going, I think this was nothing more than first book syndrome and would not let it keep me from reading the rest of the series. Things really picked up once I understood the world and where things were going and I anticipate future books will be non-stop fun and action. The world-building certainly paid off, because as things progressed the action got really, truly fantastic. The magic inparticular was exciting because it was so complex; magic isn’t a simple fix in this world, but a skill to be wielded with care and potential risk. There’s also a great deal of physical action and Gala’s a load of surprises on both fronts! Mix that with the clashing ideas about how the world should be (such as Blaise’s and Augusta’s differing opinions about nobility and peasants), the danger of Gala’s discovery, and Gala’s own personal development and you’ve got one exciting finish line! 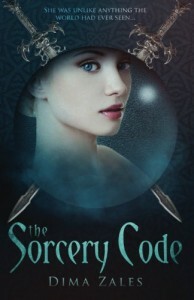 Despite having a definite case of “first book syndrome” Sorcery Code is a wonderful start to the series, complete with a complex world and wonderful characters. Can’t wait for the next one!